With great interest I have read the extensive report by Henry Tantaleán about the petroglyph rocks at Cochineros and Retama recently published in Rupestreweb (2010). I knew of the existence of those most interesting rock art sites through the works of Tantaleán & Pinedo (2005), Pinedo, Tantaleán & Espino (2008) and of course Núñez Jiménez (1986) who reported two petroglyph rocks at Retama and 10 or 12 (? see Appendix 1) at Cochineros. I visited Cochineros in 2008 and was able to record 14 rocks with petroglyphs, four of which were definitely not included in the work of Núñez Jiménez. 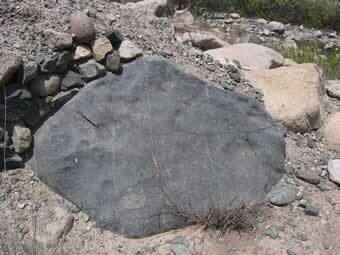 In October 2009 I communicated with Dr. Tantaleán about the (number of) petroglyph rocks at Cochineros. I also emailed him some illustrations of those purportedly new discoveries. From his kind reply it proved that I indeed had recorded four rocks that were not previously reported. 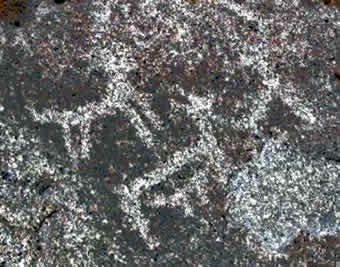 Together with the 14 rocks described by Henry Tantaleán (2010) there now are at least 18 petroglyph rocks at Cochineros. In order to offer future rock art researchers access to this additional information, I hereby present a short overview of the four newly discovered boulders at Cochineros. As the inventory by Núñez Jiménez (1986: Fig. 1427 to Fig. 1515) is rather confusing, I made my own numbering system of Cochineros (see Appendix 1). Each petroglyph boulder has been assigned an individual COC-number and the four new rocks have been numbered COC008, COC-009, COC-010 and COC-014 by me. All four rocks are rather small compared to the several enormous boulders in at this site. As my visit did not involve any scientific surveying, I can only offer illustrations (without any scale) and a brief description of each rock and a location map (Figure 1). Rocks COC-008, COC-009 and COC-010 are located rather close together a little to the west of the faint path between rocks COC-007 and COC-011, while rock COC-014 is located in the orchard just west of COC-003 and COC-004, but because of bad visibility the exact location of rock COC-014 could not be established with certainty by me. Figure 1. 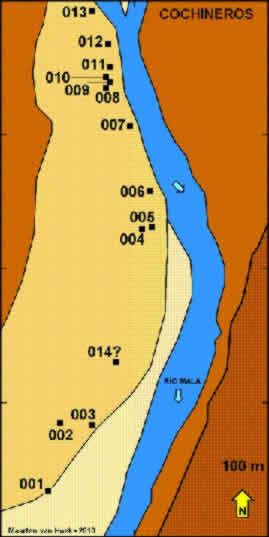 Location map of the petroglyph site of Cochineros, Valle de Mala, Peru. COC-numbers mentioned in the text. Drawing by M. van Hoek, 2010, based on Google Earth. 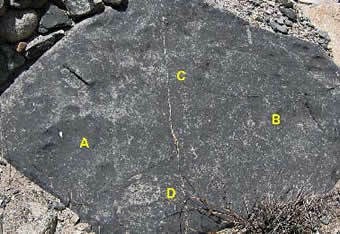 This blue-grey boulder (Figure 2) has a rather flat, fractured panel that has been weathered and/or damaged by anthropic agents. 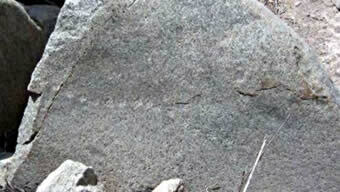 Faintly visible are two petroglyphs (A and B in Figure 3) of possible biomorphs (anthropomorphs? - lizards? ); a line of possible rings (C in Figure 3) and an oval pecked area (D in Figure 3). There are even fainter traces of pecking that may have formed images once, but that are too faint to interpret at the moment. Figure 2. Rock COC-008, Cochineros. Photograph by M. van Hoek, 2008. Figure 3. Rock COC-008. Photograph digitally enhanced by M. van Hoek. A little north of boulder COC-008 is a broken boulder, COC-009 (Figure 4), the eastern part of which has a smooth south facing panel on which is a slightly undulating, horizontal of 16 small dots (Figure 5). These dots hardly can be called cupules as they have too superficially pecked out. No further images could be seen on this panel. Figure 4. Rock COC-009, Cochineros. Photograph by M. van Hoek, 2008. Figure 5. Rock COC-009. Photograph digitally enhanced by M. van Hoek. Just north of COC-009 is boulder COC-010 (Figure 6). Also this panel has been weathered and/or damaged by anthropic agents. On a less damaged part of the panel (Figure 7) are at least three quadrupeds are faintly visible, one (with a young in the suckling position) possibly held by a rope (this however is uncertain). There are faint traces of further images on this panel. Figure 6. Rock COC-010, Cochineros. Photograph by M. van Hoek, 2008. Figure 7. Rock COC-010. Photograph digitally enhanced by M. van Hoek. 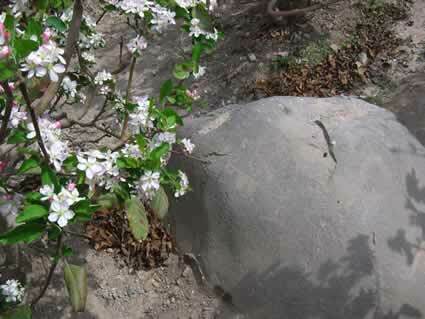 A rather small, blue-grey, dome-shaped boulder, hidden by orchard trees, has some interesting images more or less on the top and on its east slope (Figure 8). The much weathered images were only faintly visible, also because of the dust that had accumulated on its surface by the strong winds at the time of my visit. 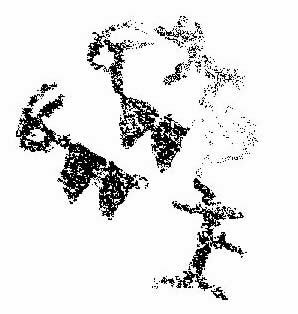 Digital enhancement of the photos that I made showed two faintly pecked biomorphs (probably quadrupeds - camelids?) one of which appeared in a tilted position. There are further faint markings on this boulder. 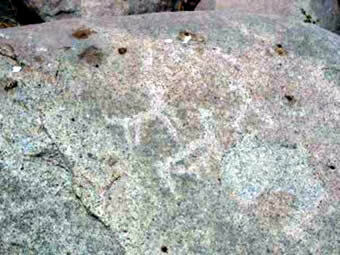 Most interesting however, are two petroglyphs each consisting of two adjacent, fully pecked triangles (Figure 9). From the left end of each row a pecked line (the neck) emerged. This line is connected to an outlined, pecked circle (representing the head) which shows two slightly curved, parallel lines. These two lines may represent the upturned ‘beaks’ of possible bird images. 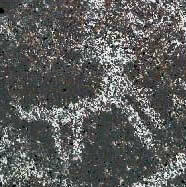 This interpretation is based on the analogy with similar petroglyphs at Cochineros. On rocks COC-001, COC-003, COC-005, COC-007 and COC-011 are altogether nine images of possible ‘birds’ composed of pecked triangles and various appendages, including possible ‘beaks’. Interestingly, the examples on COC-001, COC-003, COC-005 and COC-007 have their ‘beaks’ in an upturned position. This collection of ‘triangle-bird’ at Cochineros is - as far as I know - unique in the rock art of the western Andes. Figure 8. Rock COC-014, Cochineros. Photograph by M. van Hoek, 2008. Figure 9. Rock COC-014, Cochineros. Drawing by M. van Hoek, 2009. Because of the confusion created by the inventory of Núñez Jiménez (1986) I hereby offer the reader a list of the Piedra numbers as assigned by Núñez Jiménez and my COC-numbers. Several of the illustrations in Núñez Jiménez (1986) do not have a Piedra number (listed at the end of the Appendix) while other illustrations have incorrectly been labelled. Therefore this Appendix does not offer a complete and accurate comparison (hence the many ‘?’). A full survey is needed to correctly number all rocks and panels at Cochineros. 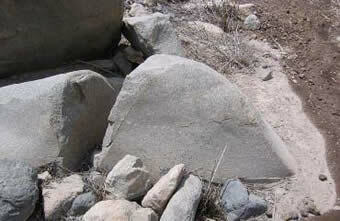 Piedra 8: Fig: 1470 - it is not certain if this indeed is Piedra 8. ? Fig: 1495 to 1497 ? Fig: 1500 to 1502 ? Fig: 1506 to 1508 ? Fig: 1511 to 1512 ? NÚÑEZ JIMÉNEZ, A. 1986. Petroglifos del Perú. Panorama mundial del arte rupestre. 2da. Ed. PNUD-UNESCO - Proyecto Regional de Patrimonio Cultural y Desarrollo, La Habana. TANTALEÁN. H, & O. PINEDO. 2005. Los petroglifos de Calango. Arkeomala: PROYECTO DE INVESTIGACIONES ARQUEOLÓGICAS ENEL VALLE DE MALA, LIMA - PERÚ. PINEDO O. AND H. TANTALEÁN & N. ESPINO. 2008. Calango Quilcacuna: Los petroglifos del valle medio de Mala (Cañete). In: Arqueologia de la costa centro sur peruana (eds. PINEDO & TANTALEÁN). pp 231 - 266. Avqi Ediciones.